‘Tis the season for large birds, plenty of gravy, and …. cocktails that double as science experiments? That’s right. Everyone knows technology is changing the way we eat, especially given just about everything in our kitchen has been grown, sprayed, or shipped with some kind of process that wasn’t around when we used to eat what we grew in our own backyard. Nonetheless, some food is a tad more reliant on technology than others. Case in point, a 3D printer that doubles as a competent pastry machine. And though we’ve all tried Spam and decaffeinated coffee once or twice, there’s a whole world full of items that simply could not exist without the aid of modern technology. Below are nine of the craziest food items that simply could not exist without a little help from the 21st century. Who knows? Maybe cricket flour is the holiday ham of the future. The aptly-titled Soylent has everything you need to survive —seriously. Although the liquid combine the words “soy” with “lentils,” it doesn’t offer any lentils and only a trace amount of soy. It’s a convenience food that claims to save time and money, providing you with all the essential nutrients you need for a balanced diet on a budget. Simply add water to the bagged powder, and presto, you’ve made your three meals. Simply saying liquid nitrogen is as cold as ice is an understatement. The chemical compound is 321 degrees Fahrenheit below zero when you take it out of its packaging, providing a doctors with means to burn off warts and instant frostbite when in contact with your skin. Nonetheless, the substance can make a pretty spectacular cocktail for the brave, mostly because it produces a cocktail that steams and whooshes like a cauldron. I’ve often heard it said that it’s not a party until someone is vaping booze. Well, maybe not, but alcohol vaporizers allow you inhale your libations in a similar way to that inhaler you used during middle school track. Vaping introduces the alcohol directly into the blood stream via your lungs, which is apparently very efficient in getting you instantly buzzed. Go figure. Without delving too deep, 3D printers use hyperspectral imaging to print a bevy of things that you wouldn’t imagine, such as materials for space stations and human organs. Chefjet’s latest line of 3D printers, for instance, will allow you to create stunning sugary treats with amazing geometric shapes. In a few years, we might see Wikicell in airports and rest stops. The machine assembles nutrition-rich food within an edible package, because, why put packaging in landfills when you could put it in your belly? 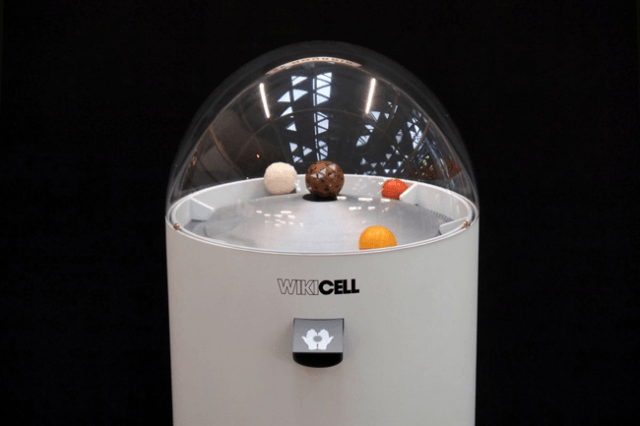 Although the vending machine is only a prototype, the edible technology is already being used in WikiPearl’s line of innovative food. The company uses the packaging technology for cheese, yogurt balls, and ice cream. It’s a big, big world out there. Given some estimations claim there are more than 30 tons of insects per person on the planet, it’s not particularly surprising that Bitty uses a sustainable method to produce a special kind of flour derived from slow-roasted crickets. The flour is high in both protein and amino acids, and best of all, it doesn’t taste like bugs. Yes, scientists have grown a burger in a petri dish. The first one may have cost more than $330,000 a pop, sure, but it’s still one of the best solutions for vegetarians to enjoy an all-beef patty without an ill conscious. Mass production of synthetic meat is likely still 20 years out, though, with mass production of good synthetic meat even further off. No, it’s not an alien cocoon from Alien. It’s your own beehive that’ll fit nicely on your patio and allow you to eat honey like a sun bear. Philip’s prototype even includes a mechanism that produces smoke to calm the bees, allowing you to harvest honey from directly inside your home without worry. It’s not exactly for harvesting honey — it’s intended to help bee colonies regain their footing following their recent collapse — but we can’t deny it’s not an added plus. It’s a mouthful, but Artisan Ice Cubes are actually a thing. It takes a little bit of tech to get these right, one that’s neither reliant on a fancy computer or a recently-discovered algorithm designed to create slow-melting ice. Instead, ice block freezers like Clinebell’s allow you to freeze 11-pound blocks of ice. The freezer essentially mimics the unidirectional freeze that happens with bodies of water, providing a dense block of ice that’s both hand-cut and slow-melting. We doubt it makes that AMF taste any better.